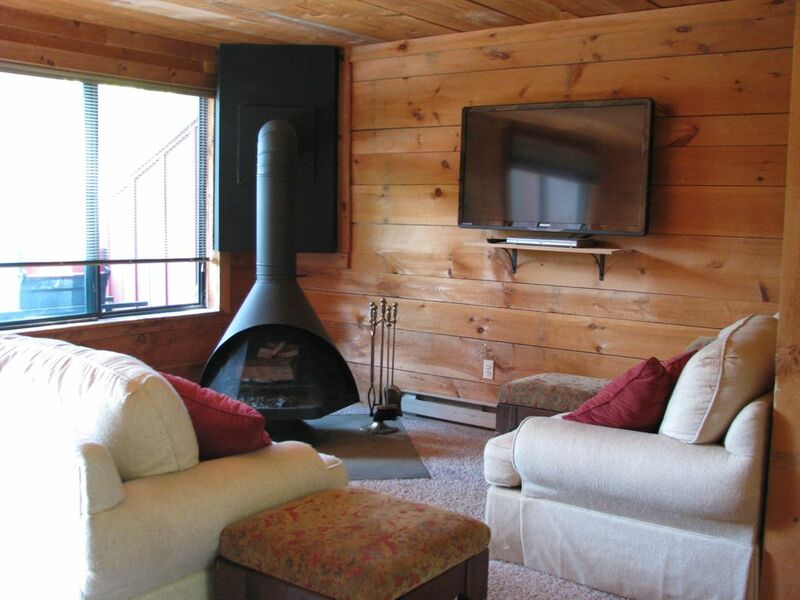 Closest To Ski Lodge 3 Level - 3 Bedroom, 2 Bath Townhouse With 2 Living Rooms! Our 3 bedroom, 2 bath townhome is perfect for the family that likes to play together! 'Base Camp' has everything you could want for a family getaway. Board games, movies, comfy furnishings and cozy blankets await at our retreat on the mountain. King, queen, full, and bunk beds will fit your whole gang. This townhome sleeps up to 12 with beds for everyone. Base Camp's location is one of the very best on the mountain. Not only are you steps from the main lodge, you can walk down to the lake, activity center, sports club and pool, spa and conference center, and easily walk home after a fun apres ski at the lodge bar! Many guests prefer a location close to the lodge to ski in/ski out. It's tough to carry all of your gear and lunch on skis down to the lodge! Even if you think you will go back to your rental for lunch, invariably everyone always meets at the need to drive there, just pop on your boots and you're halfway there! If you don't feel like taking the short walk to the lodge, you can always hop on the shuttle that stops right outside of Base Camp's is very convenient! Bedroom 1 - Master bedroom has a king size Memory Foam bed, large closet, flat screen television, and IPOD docking station. Bedroom 2 - This room has a queen sized bed and large closet, with views of the lake and slopes. This room has a flat screen tv. Bedroom 3 - This room has a set of twin bunk beds, flat screen tv, closet, and desk with chair. Basement Family Room - This is a huge space that has a fold-out queen sized couch as well as 2 twin daybeds. This family room has a large flat screen tv, full bathroom and laundry room with washer and dryer. Additional Bedding - The main living area has a fold out couch that turns into a queen sized bed. The Kitchen - This is a Chef's Kitchen! Every single appliance you could want from a panini maker to crock pot to oversized blender. The kitchen is fully equipped with everything you need to feed your hungry family. It overlooks the living area and has a 3 seater bar. The dining table seats up to 12 with 2 leaves. It's easy for everyone to eat together or play a round of cards over hot cocoa. The Living Room - Complete with a cozy fireplace, big couch and loveseat. Watch a movie from our fun library of movies on the 42 inch flat screen TV. DVD player and cable TV are ready for a relaxing family night. Deck - The deck is right off the dining area with a grill that is ready to use. Don't miss the torchlight parades on Saturday nights! Linens are included, pool towels are available when visiting the indoor pool for a fee. We are an adventure loving family that is excited to share our getaway with you. We have used it for skiing, whitewater rafting, a weekend escape to see fall leaves, and for a week of crisp nights in the summertime. There simply isn't an off-season here! 'Base Camp' is a place that we bought to connect with our family and to make memories with our kids. Be sure to sign our guest book and tell us about the memories that you have made! 'Base Camp' has a premium location at Hidden Valley. Close to everything, within walking distance of the lodge, lake, spa, pool, and activity center make it a very desired spot at the resort. Two outdoor seasonal pools to choose from. Great size for our group, nice to have three floors. Fireplace worked well, really warmed up the room. Owner/manager was very responsive. We had some rain during the weekend, but had a great time regardless. Nice place, owner was excellent with communication. Highly reccomend!! Cozy house perfect for weekend in the snow! Great house with a view & super close to everything! Perfect for the family getaway. Thank you so much for choosing Base Camp for your getaway! I felt at home and comfortable. Loved the area, especially the deck overlooking the lake. Some small minor issues - no propane, musty smell downstairs. It is a beautiful, quite area and I was pleased that I decided to choose Basecamp. Thank you so much for your review, feedback helps us to provide a better experience for our guests! There is a dehumidifier in the basement for guests to plug in as they see fit to diminish the humidity on the bottom floor. This detail was not listed in our welcome documents and has now been added. The propane tank has been refilled and again, a reminder has now been added to our check out procedures so that the tank is not accidentally left open by guests. We are glad you enjoyed the beauty of the mountains and took advantage of the rest and relaxation. Very clean,cozy! Wonderful view around the house and the owner's response was very quick. Loved this house. A sixty (60) day notice is required for cancellation. Cancellations that are made more than sixty (60) days prior to the arrival date will be offered a credit towards a future stay. We do not offer cash refunds. Cancellations or changes that result in a shortened stay or that are made within 60 days of the arrival date forfeit the full advance payment. Early departure does not warrant any offer of credit towards a future stay. No offer of credit towards a future stay will be available for unforeseen circumstances such as illnesses, change of circumstance or desire, bad weather,and the like.